Book describing the daily lives of staff and patients in Jersey hospitals and nursing homes during the Occupation years from 1940 until 1945. 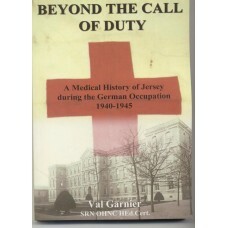 Most staff came into contact with the Germans and some were required to work with them. From their fascinating stories and from the Medical Officer of Health Reports, details are revealed of a dramatic change in lifestyles and medical conditions. Some of these conditions resulted directly from the privations of the war years, whilst others were eradicated, or lessened, because of it. The book reveals innovative ways of coping with the scarcity of medicines, commodities, light and fuel; and the dedication and steadfastness of many of the staff in helping others, above and beyond the call of duty.